Keeper of the Beat was the "smash hit" at the Mill Valley Film Festival! Click to download the 2019 Digital Launch Budget. Keeper of the Beat is a feature-length autobiographical documentary in which Barbara Borden, an extraordinary drummer, composer, teacher and peacemaker, tells her inspiring story in words and music. The film comes to life through footage from She Dares to Drum, Barbara’s critically acclaimed autobiographical “percussion play” and archival clips of performances by the ground-breaking women’s jazz band, Alive! 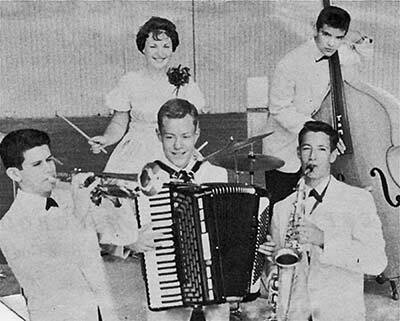 along with other bands in which Barbara has performed. In addition, the film features interviews with a range of noted artists and thinkers, friends, students and people in far-off places (Zimbabwe, former Yugoslavia, Siberia) whose lives have been deeply affected by Barbara’s music and presence. Born into a Jewish immigrant family, Barbara was the kid sister of the show business Borden Twins, who performed on TV shows from the 1950s through the ‘80s. Given a drumset by the twins, Barbara soon established herself as a hot-shot "girl drummer," performing at the Hollywood Bowl and in nightclubs in L.A. and San Francisco. Marriage and self-doubt led her to abandon her burgeoning career for "normal life." In the '70s, when her marriage ended, Barbara found herself at the center of the feminist cultural revolution as the drummer in Alive! After eight years of touring and three albums, her five-women musical family fell apart, and Barbara once again had to face the conflict between her love of drumming and her doubts about her ability to keep the beat on her own. Since then, Barbara has become a citizen of the world, traveling and drumming in the former Yugoslavia in the midst of civil war and in Zimbabwe at a time of brutal dictatorship and economic collapse. In 2008, she and her Fools Gold Band performed in Khakassia (Siberia) and Barbara formed an extraordinary bond there with the world-renowned shaman, Tatiana Kobezhikova. 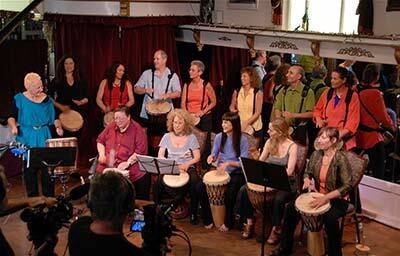 To people in these countries, Barbara brought joyful cross-cultural connection with her "drumbeat diplomacy". In the United States, she also expanded the circle of her connectedness. For a decade, Barbara has taught drumming to a multitude of people including members of the Mill Valley, CA retirement community at The Redwoods (age range 75 - 101) . A timeless spiritual dimension of her art opened up when Barbara gave a heart-shaped drum that had been made especially for her to a woman leader of the Suquamish tribe who had responded deeply to the call of the Heart Drum. Currently, Barbara is performing with her Hearts on Fire Drummers, expanding her teaching internationally and continuing to keep the beat with love, joy and passion.